Opened in 2008, Santa Fe's new central park is rapidly becoming a favorite place to get outdoors in Santa Fe. 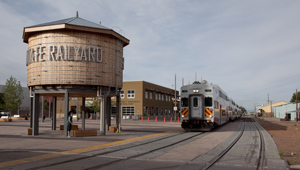 TPL helped the city acquire a former railyard and later oversaw design, fundraising, and construction of the one-acre plaza and ten-acre park, including a performance green, climbing wall, playground, and bike and pedestrian trails. Surrounded by museums, galleries, live-work studios, an elementary school, and a teen center, the public space celebrates the history, creativity, and diversity of the city.